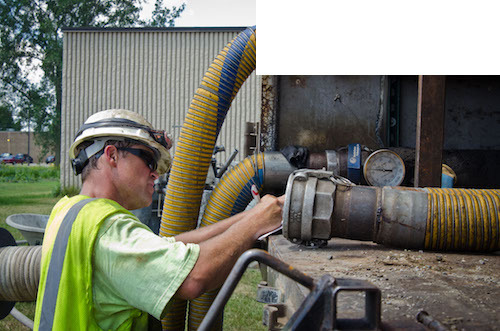 An official records data during work on a government waterworks project in Michigan in 2011. USDA photo by Lance Cheung, public domain. People in developed countries turn on the tap and safe drinking water flows, a dramatic health benefit they tend to take for granted. That complacency was dramatically disrupted in the U.S. last year when American children in Flint, Michigan, started testing positive for lead poisoning and the source was traced to tap water. At Canada’s McMaster University in Hamilton, Ontario, researchers are working on a different approach to water sensor technology — one that is vastly cheaper. Gay Yuyitung, executive director of the McMaster Industry Liaison Office, says university researchers are working to produce sensors that cost around US$10. Miami–Dade County’s parks system in the U.S., which uses more than 300 million gallons (1.14 billion liters) of water annually, is using IBM’s platform to detect irregularities in water consumption and dispatch park managers to check them out. “We’re saving literally months in finding and reacting to those repairs that are needed,” says Jack Kardys, director of Miami–Dade County, Parks, Recreation, and Open Space Department. The department anticipates 7 to 12 percent savings on its annual US$4 million water bill. This story was first published by Ensia.